Oh the excitement of finishing another quilt! I love that quilts have stories. My hope is to tell a story with each of my quilts. 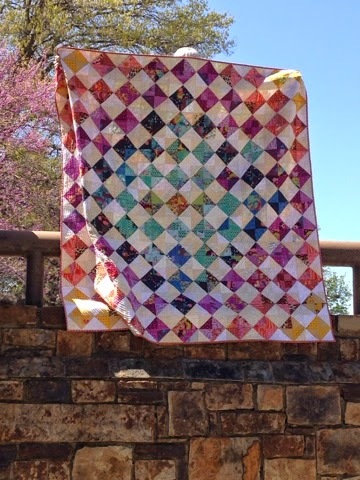 The story of this quilt is that we all make mistakes and that we can find beauty in the mistakes of life. Yesterday was rough. Each kid spilled all kinds of things. All. Day. Long. We had broken eggs, paint splattered everywhere, water all over plates, water all over food, and water all over people big and small. We had babies with markers writing on themselves. We had mud. We had life. Beautiful life. I finished this quilt a few weeks ago. I was beyond excited about the rainbow of colors and the spiral quilting until I was nearing the end. Then, I noticed that I reversed two squares and no longer had what I planned. 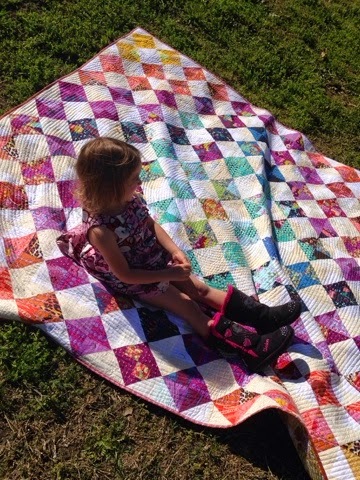 Do you see my mistake or do you see a happy little girl and a beautiful quilt, both to be cuddled for many, many years? As a parent and just as a human, I am daily faced with slip ups, mistakes, spills, and every other unintended act that occurs in this learning place of life. Anger is also there. Discouragement. Frustration. My own inadequacies. Thank you God for the Holy Spirit, who not only continues to show me grace, but he also helps me show my children the grace they need. "But when the Father sends the Advocate as my representative--that is, the Holy Spirit--he will teach you everything and will remind you of everything I have told you." John 14:26. I love this verse. The "Advocate" is also translated as the helper, the comforter, and the counselor. The Greek word used is "Paraclete" which generally is a helper. In a legal sense, it is referring to a counselor or attorney. I have even read that among Jewish writers, a good deed was called a paraclete or advocate, and a transgression was an accuser. Revelations 12:10 calls Satan the Accuser of the Brethren. Nowhere in scripture is the Holy Spirit referred to as our accuser. This is so freeing. It helps me discern between the voices that remind me of my mistakes and constant error and the voice of hope that remind me of God's word. So, here is my quilt and its backside. Lots of half square triangles that took longer than I would like to admit. Despite how sad I was when I caught my mistake after I had quilted over it, the beauty of the quilt completely changed. It changed to joy over the fact that life is full of imperfections and that imperfections can still be beautiful. 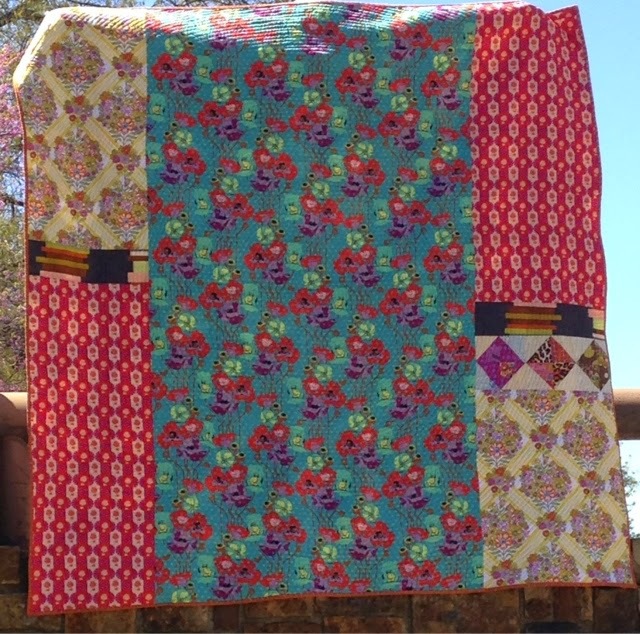 I choose to see the joy in a completed quilt, a quilt that will cuddle many little ones during movie nights. I love to look at the overall picture and embrace that beauty and perfection are not the same. I look at quilts like art work. Quilts make me feel, and my hope is that I can convey that emotion. 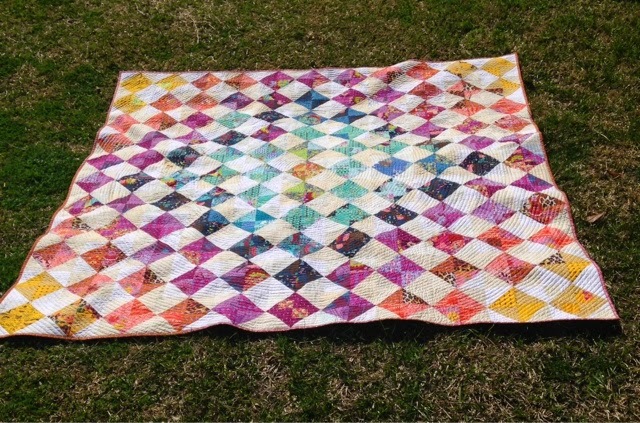 This quilt speaks volumes to me of happiness in the midst of errors that you cannot undue. So, how do I deal with oversights, mistakes, spilled milk, and all the other "fun" stuff that goes with being a human and a parent? (1) Speak gently. "A gentle answer turns away wrath, but a harsh word stirs anger." Proverbs 15:1 When you feel yourself getting upset, do everything you can to lower your voice and speak in the sweetest voice you know. If you cannot answer "soft and gentle," then do not answer. This does amazing things when dealing with young children. The quickest way to bring anger into a situation is to start yelling. I may or may not have initially thought yelling was the best solution. Ephesians 4:31 tells us to get rid of all bitterness, rage, anger, harsh words, and slander, as well as all types of evil behavior. Notice it classifies anger and harsh words along with evil behavior. Ouch. (2) Remember how Christ has forgiven me. The next verse in Ephesians tells us what to do instead of having anger and harsh words. "Instead, be kind to each other, tenderhearted, forgiving one another, just as God through Christ has forgiven you." I can easily remember where I have missed it in the passed. My mistakes are so much more massive than a spilled glass of water and mud tracked through the house. (3) Give hugs. Lots of hugs. When we hug someone, our pituitary gland releases oxytocin, which lowers our heart rates and our cortisol levels. Cortisol is the hormone responsible for stress, high blood pressure, and heart disease. Also, studies shows that the brains of early-nurtured kids have a larger hippocampus, which may make it easier for them to learn, improve their memory, and even respond to stress. No matter how well-nourished and intellectually stimulated a child is, not having human touch can stunt their mental, emotional and even physical growth. Hugging and holding is my go-to response for crying, missed expectations, and mistakes. It seems to send an instant message that everything is going to be ok. I think we underestimate the power of a loving touch for both ourselves and our children when dealing with mistakes. (4) Do not rehearse the mistake in your head. Rather, remind yourself of God's ability to make all things work for good. "We know that God causes everything to work together for the good of those who love God and are called according to his purpose for them." Romans 8:28 Talk to God about how to make things right. "Give all your worries and cares to God, for he cares about you." 1 Peter 5:7 I do this step while cleaning up the mess. Life requires lots of clean up. (5) Direct. Re-direct. Train. Explain. Re-explain. Direct your children onto the right path, and when they are older, they will not leave it. Proverbs 22:6 There are lots of applications for this scripture. I just want to point out that we need constant direction, training, and explanation. Life is about learning. Not about being perfect. My goal is to make my home a safe place for learning for my children. These are just a few of the things I aim to do when dealing with the everyday frustrations of living with small children. Every day is a learning process for me as well as them. I would love to hear your feedback. How do you deal with anger? How do you cope with all the slip-ups, spills, and accidents that try to steal your joy on a daily basis? Leave me a comment. I would love to learn from you as well.